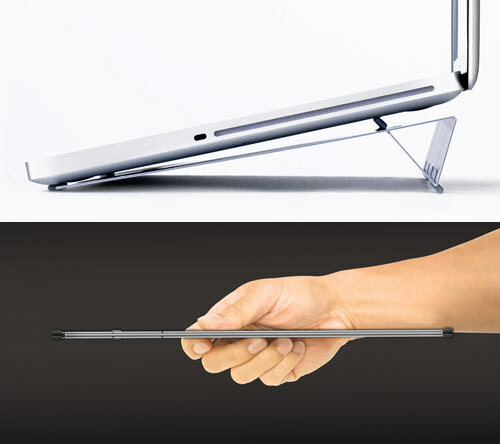 The AViiQ is a super slim laptop stand, so much so that it’s claimed to be the thinnest stand in the world. It measures less than 1/4″ in thickness and weighs 5.5 ounces. Size wise, it is 12.75 inches long and 2.75 inches wide. It is made from a material called Hylite which is a mix of aluminium and polyproplene which allows it to stay flexible but be strong and rigid. When unfolded, the stand raises your laptop at a 12 degree angle which allows for air flow to keep the underside of the laptop cool. 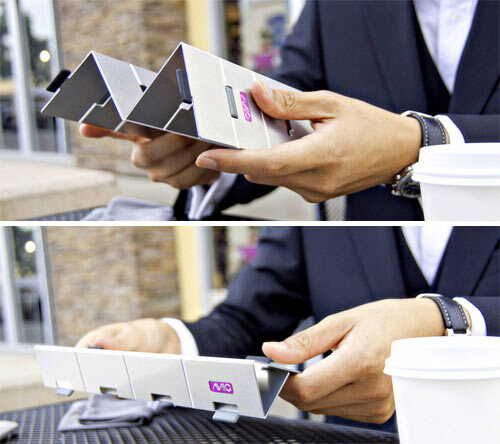 Once finished with, it folds up in to a super slim package for carrying around in a bag or the pocket of a laptop bag. Price wise, it costs a mere $80… yeah, kind of ouch but for some reason it looks quite cool at the same time.